“The successful interdiction of the A9 highway, which we held for thirty-three days until the fall of Elephant Pass despite massive onslaughts by the Sri Lanka Army to dislodge our troops, is the greatest achievement of the Charles Anthony Brigade. 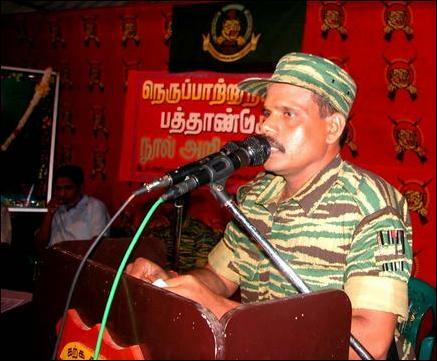 He who owns Elephant Pass owns Jaffna,” said Col. Balraj, senior commander of the Liberation Tigers, speaking at the launch of a special volume on the first conventional military formation of the Liberation Tigers Wednesday in Kilinochchi. Col. Balraj was the first special commander of the Charles Anthony Brigade when it was formed in 1991. The elite formation has its own military academies, research units and defence colleges for its officer corps. Speaking of the Brigade’s history, he said: “Our first conventional military formation was formed with 1500 fighters. But 1056 laid down their lives during ten years of fighting. Charles Anthony lost 14 of its valuable commanders in the war. There were 6 special commanders among them. It is no easy task to make a special commander. Ordinary persons cannot command Charles Anthony. It fought 14 major battles starting with the SLA's ‘Operation Vanni Wickrama.’ Fifteen Black Tigers of the Charles Anthony formation sacrificed their lives for its many victories and for this country." Addressing the book launch, Mr. V. Balakumar, senior member of the LTTE said: “We want to politically and diplomatically engage the world with the same zeal with which we fought the war. The story of Charles Anthony reminds us that we should not forget the extremely dire situations in which the Liberation Tigers survived in the early days of the liberation movement. "But I can proudly say that the spirit that animated the fighters such as Charles Anthony who had to lead very simple lives in anonymity does still inspire our junior commanders. This is why even today you will not realise that hundreds of them produced by our military system are moving about amongst you like ordinary men and women. You may not recognise them. But they are our great asset, the basis of our military preparedness. The writer Nilanthan also spoke. 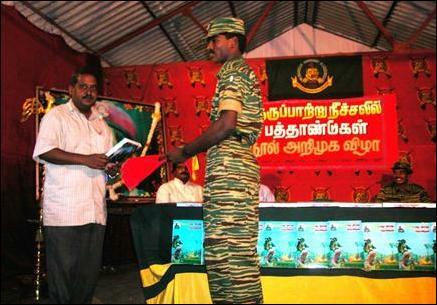 01.10.03 Tenth anniversary of Charles Anthony brigade observed in Jaf..